Thirty years ago I was captivated by the original movie The Terminator. It was one of the few science fiction action films that I really enjoyed. I remember well being fascinated by Arnold Schwarzenegger even though he scared me half to death as the Terminator. With his ability to maintain that stoic look on his face, he easily made you believe he was a cyborg bent on murder. Ten years later when The Terminator II: Judgement Day came out in theaters and Arnold Schwarzenegger was allowed to be the "good" Terminator, I was truly spellbound. It took me a bit to adjust to him being the good guy, especially since he maintained that stoic appearance, but I freely admit I much preferred him in that role. I liked liking Arnold. However, a few days ago I had the opportunity to see the latest sequel of The Terminator series and found it to be the best yet. Arnold Schwarzenegger is not only a protector in this latest film, but he has developed some human traits while living with humans even though he is still very much a cyborg. He seems to have developed paternal feelings for Sarah Connor and his attempts to smile like a real human actually make you laugh. I really like Arnold in this role. How cool it is to look back across the last 3 decades and realize that I have gone from be scared witless by Arnold to loving his character in Terminator Genisys. As you would expect, there are some very obvious changes in the movies, but Arnold Schwarzenegger masterfully playing the part of a time traveling cyborg is consistent. The plot is once again about individuals from the future traveling back in time to change the course of events. This time, however, the mission is to stop Skynet before it ever starts there by eliminating the war between humans and artificial intelligence. Terminator Genisys has otherwise changed things quite a bit. Sarah Connor is now a young, pretty, and competent warrior who was raised by "Pops", Arnold Schwarzenegger, since she was nine years old when her parents were killed. The part of Sarah Connor, who was originally played by Linda Hamilton, is now cast with Emilia Clark, but the personality of Sarah Connor is different since her childhood is now different. Surprisingly, it is not that confusing when you see the actual movie. The human resistance leader, John Connor, still sends Kyle Reese, his father, back to protect and team up with his mother, Sarah Connor. However, they really are more of a team this time instead of the hero who saves the defenseless woman by offering the ultimate sacrifice of his own life. As a matter of fact, Sarah Connor, Kyle Reese and the Guardian aka the original Terminator, Arnold, make an awesome team trying to destroy Skynet before it ever starts. There is a lot of action and blowing things up in this movie, just like it's predecessors, but the biggest difference for me is that the first few movies seemed more fantastical. Where I was afraid of the Terminator in the original movie, with this movie I find myself more afraid of Skynet. Perhaps that is mostly because I now believe the idea of artificial intelligence taking over the planet is not that hard to envision. In fact, throughout the movie, I kept thinking about the Amazon Echo sitting on my table back home. I felt a strong desire to unplug her and throw her away as soon as I got home. As I write now, I am wondering if she is reading what I have written. Yes, I am jesting, but it did cross my mind. I would definitely recommend seeing Terminator Genisys, even if you have not seen the previous movies. Not only do I prefer the characters in this sequel, but I liked the clear shift of humans being smart and proactive enough to strike the origin of the problem instead of simply defending themselves. This movie could easily stand on it's own as a cautionary tale to all of us with a message to be careful of what we ask for and what we so easily embrace as the way of the future. After all, we do want to preserve our human future over advanced technology. One note: There was another Terminator movie sequel, Terminator Salvation, that did not feature Arnold Schwarzenegger at all. He was governor of California in real life and unable to work as an actor during his terms in office. I do not personally consider that a viable Terminator movie because, as far as I am concerned, Arnold Schwarzenegger IS the terminator and without him, the movie is an empty shell. I too enjoy Arnold and the Terminator movies. Thanks so much for the review. I look forward to seeing the movie. Interesting that Arnold Schwarzenegger began as The Terminator in his early acting career (among other movie credits he acquired), then served as Governor of California, and now is back to acting. 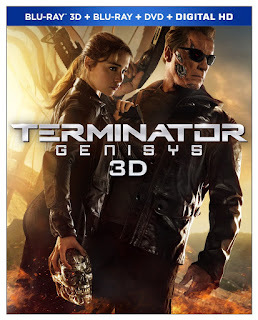 My Sci-Fi fan 'kids' (daughter & son-in-law) have been telling me about 'Terminator Genisys' and now I know more, with your excellent movie review. Awesome review and I now can't wait to see this new Terminator movie. Sounds like I'd enjoy this movie, putting it in my list of must sees as well. Thanks for a great review......going to share it now.